The UK is once again in the grip of Olympic fever as the Rio games get into full swing. With Team GB already well on its way to a sizeable medal tally which could eclipse the haul from London 2012, we profile the traits of five of the games’ top athletes, which you should look for when interviewing candidates. The iconic Jamaican sprinter is both Olympic and box office gold. 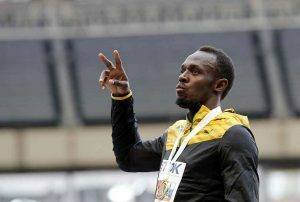 With six gold medals under his belt, from two Olympics games, Bolt has already added to that tally in Rio, as he looks to cement his reputation as the greatest male sprinter of all time. But while his steely determination to be the best shines through on the track, away from it, his undoubted wealth of talent is matched only by his showman’s personality. In short, he’s an extrovert… and an immensely likeable one at that. Appointing a candidate with even a fraction of Bolt’s charisma could pay dividends for your business. The poster girl of Team GB stole the heart of the nation when her heroics on ‘Super Saturday’ during London 2012 saw her scoop gold in the women’s heptathlon, before adding a silver in Rio. She juggles a gruelling training schedule in order to prepare for the seven individual events which comprise the heptathlon. Jessica’s multitasking is clearly a strength which would transfer well into your workplace. Another British athlete with a huge fanbase, Tom Daley is carrying the hopes of Team GB’s divers on his shoulders. He may still be only 22, but Rio is Daley’s third Olympics and this year, he’s going for gold in the men’s 10m platform to add to the two bronze medals he already has in his locker. He’s a prime example of how hard work and dedication over the long-term can result in success. These are two traits you should be looking for in your candidates. A double gold-winning cyclist at London 2012, Trott made history at the weekend by becoming the first British female Olympian to hold three golds, after leading the Team GB’s ladies’ team to success – and a world record – in the women’s team pursuit. Although her icy demeanour betrays little emotion on the track, in media interviews she mixes fierce intelligence with an easy-going nature and a sense of humour which makes her a firm favourite with sports fans up and down the country. She has exactly the type of personality that many employers crave. The East Midlands has a proud recent history of developing medal-winning Olympic and Paralympic champions, with Sam and Ollie Hynd and Rebecca Adlington all hailing from this neck of the woods. Adam Peaty is the latest name on that illustrious list. The 20-year-old swimmer put his home city of Derby on the map in the first week of the Rio games when he took gold in the men’s 100m breaststroke, beating his own world record twice in the process, before winning silver with the men’s 4x100m medley relay team. Away from the pool, he’s calm, level-headed and grounded, all good attributes to look for in potential candidates. The expert team here at QS Recruitment can help to source the very best candidates for your vacancies and help you throughout the interview process. To find out more about how we can help your business recruit for success, give us a call on 0115 9422008 or email info@qsrecruitment.co.uk.